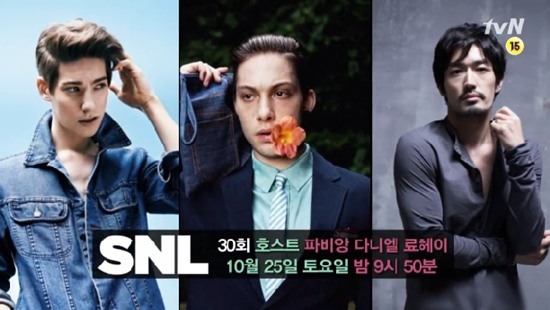 Cable television network tvN has tapped three international entertainers to host its signature comedy show “Saturday Night Live Korea,” the broadcaster said Tuesday. Fabien Corbineau of France, Ryohei Otani of Japan and Daniel Snoeks of Australia will join the original team of “SNL Korea” entertainers, including Shin Dong-yup and Yoo Sae-yoon. Before “SNL Korea,” the international trio gained rising popularity on Korean entertainment shows. Corbineau is currently engaged in a popular reality show “Roommate Season 2” on SBS. Otani built an acting-entertainment career through the film “Roaring Currents” (2014) and MBC’s entertainment show “I Live Alone.” Snoeks also gained high popularity through the television talk show “Abnormal Summit,” currently airing on JTBC. The trio will join the Saturday show starting Oct. 25 at 9.50 p.m.